The Hibs’ clan celebrating their win over Valletta in the 1997-98 FA Trophy final which made up for their humiliating 9-0 defeat to the Citizens in a pre-season competition. Hibernians and Birkirkara launched the 1997-98 football season on July 11, 1997 in the opening match of the Lowenbrau Cup. The Paolites used this game to introduce Englishmen Mark Wally and Lee Barkus and give a run to some of their reserve players. The Hibs youngsters played a good game but the team was too inexperienced to beat a Birkirkara XI geared up to win the trophy. However, despite their lack of experience, Hibs still earned a 2-2 draw. Fielding more or less the same eleven, Hibs met Valletta three days later at the Victor Tedesco Stadium for the second match of the competition. It was good to see the Hibs committee keep faith with the youngsters but pitting inexperienced players against Valletta’s seasoned stalwarts was, it has to be said, more than a little foolhardy. Valletta took to the field with their best formation and were in no mood to dish out favours. Sensing the weaknesses of their opponents, the Citizens went into the game as if their very lives depended on the result. It did not take them long to break Hibs’ tame resistance and in the end, they won by the rugby score of nine goals to nil! This was an embarrassing moment for the Hibs committee and their loyal supporters. It was difficult for the fans to stomach the way Valletta had capitalised on the fragility of the Hibs’ XI to enhance their own reputation. Hibs, however, should have known that there is no place for sentiment in football. Fortified by this result Valletta faced Birkirkara two days later needing only a draw to win the pre-season competition. The Stripes went on the warpath from the word go but it was Gilbert Agius who opened the scoring for Valletta in the 23rd minute. Birkirkara rallied and, for the rest of the first half, enjoyed the best of the exchanges. Then, just before the half-time whistle, Antoine Zahra scored a deserved equaliser. The second half had barely started when Ferenc Lovacz restored Valletta’s lead. The Citizens now seemed to be home and dry but an 84th-minute penalty converted by Zahra gave Birkirkara fresh hope. For the remaining few minutes, the Stripes staged a desperate siege on the City fort but Valletta held on until the end to lift the first trophy of the season. Hibs never forgot their humiliating loss to Valletta. They were after revenge. That season they met Valletta three more times in the league but lost the games 0-1, 0-4 and 0-2. They finished in fourth place in the league and their only chance of salvaging something out of that season was in the FA Trophy. In those days, the FA Trophy always seemed to elude Hibernians. Eighteen long years had passed since their last success in this competition. 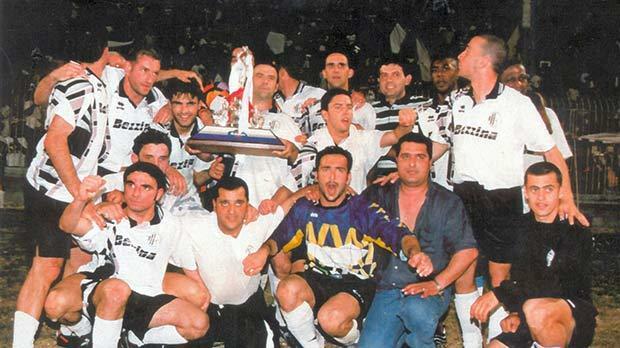 During that period, they only reached the final once in 1997, losing 1-2 to Valletta. Many of their supporters did not even remember the great 1980 Hibs side which had completed their first and, so far, only league and cup double. Therefore, when Hibs made it all the way to the final in 1998 for the second year running, there were great expectations in Paola. Hibs beat Rabat 3-1 in the first round and Xgħajra Tornadoes 4-0 in the second before meeting Tarxien Rainbows in the quarter-finals. Hibs won the ‘derby’ 4-1 without expending much energy. They then disposed of Marsa 2-0 in the semi-finals. The final, the second in succession between Hibs and Valletta, never reached great heights. The game came to life only after the resumption when Charlie Scerri broke the deadlock for Hibernians. Thereafter, Hibs held the upperhand. Eighteen minutes later, they doubled their lead and controlled the Citizen’s reaction. Valletta reduced the arrears in the closing minutes but this was not enough to prevent the Paolites winning the FA Trophy for the sixth time in their history. Nothing could taste sweeter for Hibs at that moment. They had broken their FA Trophy jinx and gained revenge on Valletta for that humiliating pre-season defeat. In addition, they also broke Valletta’ monopoly on the cup since the name was changed to the Rothmans FA Trophy. That evening there were great celebrations in the Paola square which went on until the early hours of the morning.